We’ve talked about my underwear before, so this does not, in fact, represent a new low for this blog. I didn’t intend to bring it up again, but today, while I was laying out the laundry*, I noticed my few remaining American under garments were starting to show signs of terminal wear. I never thought I would see the day, but I think it is time to retire them. 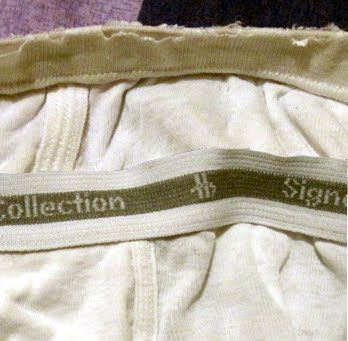 These particular tighie whities, in case you haven’t been keeping up with the story arc, were purchased prior to my move to the UK and have been in service every since. For these long years they have provided unfailing support and comfort—a bit of home away from home. My British underwear? Pha! They were inclined to stretch, wear out, rip and shrink in some truly uncomfortable ways. Many packages of them have come and gone while my American made Haines continued to soldier on. And I suppose, if their inevitable retirement has arrived, this was an auspicious time. They were purchased in a big bundle from Sam’s Club just about the time Osama Bin Laden made it to the top of the USA’s Most Wanted List, so to put them out to pasture now seems a fitting tribute to them, representing America’s commitment to get the job done, no matter how long it takes. They are the Green Beret of underwear, and I believe they deserver...sorry, I got a bit misty there. US underwear to 7 month old British underwear. So now I am consigned to second-rate undergarments. I did consider picking up another bundle on my recent visit to the homeland, but I was told the ones on offer are now made in China, so I declined; it would just have been a disappointment. All I can do is preserve their memory, and draw comfort from the fact that, for a time, I had the best underwear the world has ever produced. I only need to think of a fitting way to honor their passing; they simply cannot be thrown out, that would be a sacrilege on the scale of dumping an old flag in the trash. I wonder if my wife would mind if I had one framed and hung it on the wall. *actually, I was getting dressed after taking a shower, but I didn’t want that image seared into your brains at this early hour. Reccomend you try Marks and Spencers. Thier brand label is St Michael; well it used to be. Thus making St Michael the patron saint of Britain's knickers. I swear by Marks and Sparks undies. Should I hire a bugler to play Taps? Kat: Yes, I think that would be appropriate. Leon: i have had some good luck with M&S. I'll have to look for St. Michael's brand. The one in the photo was for a batch I bought at BHS--they were rubbish. Yeah, Bhs - not good for undies. M&S have retired St. Michael as a brand, but still have decent ones of various types. My son favours the brightest, loudest things he can find, usually from Next, who seem to do a good line in huge flowers or multicoloured union jacks. You, on the other hand, may wish to stick with M&S. Unless you consider yourself cool and want to wear your trousers down low to show off your new purchases, in which case you probably want Calvins. Mrs Baum: I suppose the only people not complaining about the droopy trouser fad are underwear manufacturers. They seem to have benefited form it. You hit the nail on the head, Mike. P.S. I really enjoyed reading your blog, especially the piece about your American "Hanes" underwear. Damn! Another typo--I meant "benefited FROM it"
Ha - I will resist the temptation to keep pointing out your typos!